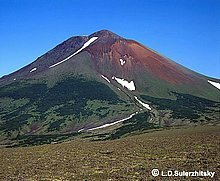 Location: The volcano is located in the Southern volcanic zone of Kamchatka on the northeastern coast of Kurilskoye lake. залегающих на склонах. У юго-западного подножия вулкана в озере Курильском — горячие ключи . The principal hazards of the volcano are phreatic explosions, ash clouds, ash falls, pyroclastic flows and surges, lava flows and lakhars. Proximity of this volcano to Kurile Lake suggests additional hazards related to possible disruption of the lake by collapsen products into the lake.